North Haven, Connecticut - Monday, April 8, 2019: North Haven H.S. baseball vs. Amity H.S. Monday afternoon at North Haven. NORTH HAVEN — When looking at the final outcome, it would be hard to believe a first-inning pickoff was one of the biggest plays in the game. 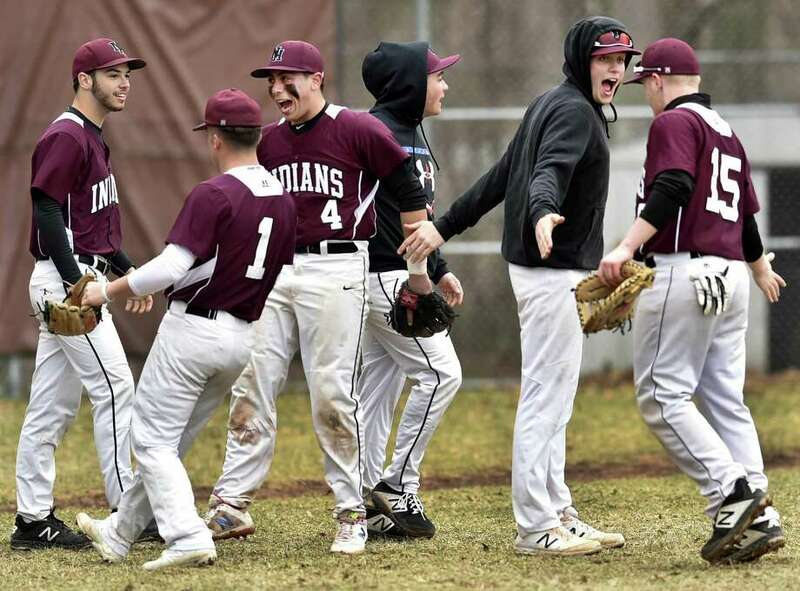 Such was the case Monday afternoon in North Haven during Amity’s 10-0 Southern Connecticut Conference interdivision victory over North Haven which was stopped after five innings due to the mercy rule. With the bases loaded, one out, and the Indians looking to score the first run of the season off Amity starter John Lumpinski, North Haven watched as Lumpinski picked a runner off third for the second out, then got a ground ball out to end the North Haven threat and best scoring opportunity. North Haven (1-3) got one more runner as far as third, that coming in the second inning when Mason Balmer singled to right, stole second, and went to third on a wild pitch, but Lumpinski struck out the final two batters of the inning. Lumpinski retired his final 10 batters before being replaced by Ethan Kaempffer with two outs in the fifth as Coppola looked to keep Lumpinski’s pitch count down. Lumpinski allowed just two hits, struck out five and walked one in improving to 2-0 on the year. While Lumpinski was keeping North Haven off the scoreboard, Amity rattled four North Haven pitchers for 14 hits, and took advantage of two North Haven errors. The Spartans scored five times in each of the third and fourth innings to improve to 2-1 on the season. The Spartans took a 5-0 lead by batting around in the third inning. Lumpinski and Jack Ranani led off with singles and each advanced to scoring position with a wild pitch. Lumpinski scored on a wild pitch by North Haven sophomore starter Jason Mazzaro for the first run. With two runners in scoring position, Cole Kuchachik reached on an error to score Ranani, and Jonathan McNelis doubled to score Peter Spodnick, who reached on an infield single earlier in the inning. Mazzaro was replaced by Benjamin Sbabo, who balked to score Kuchachik, before Julian Stevens doubled to score McNelis. After Lumpinski retired the Indians in order in the third, Amity batted around once again in the fourth, scoring five runs for a 10-0 lead. Lumpinski again started the rally with a single, Ranani reached on an error, and Spodnick reached on a bunt single to load the bases. Nicholas Rossi relieved Sbabo, and Kuchachik singled to score Lumpinski. McNelis followed with a run-scoring single, Spodnick scored on a wild pitch, Sebastian Formica delivered Kuchachik with a single, and McNelis scored the final run on a fielder’s choice. John Lumpinski — Amity senior allowed just two hits, while striking out five and walking one. He also added two hits at the plate.